It’s easy to poke fun at Batu Belig, just as it is to lampoon Seminyak, Kuta, Ubud and just about anywhere else in Bali. At the present time, BB is the demarcation between the upscale tourist enclave of Seminyak (think Bali’s Double Bay or South Yarra) and the still largely untouristy areas further north, most notably Canggu and Umalas. While expat families stake out the Canggu Club like a local version of White Mischief except with water slides and bowling alleys, the northern expanses is also a favoured location of European mid-life Peter Pans with surfboards, abounding in man buns, ironic facial hair and skinny jeans, and the greyhound-sleek Francoise Hardy lookalikes they pillion. It’s all part of the rich tapestry of life in Bali, from which they dangle like a colourful thread. I love them all and wish the boundless gifts of the Universe to settle on their well-sculpted shoulders. They whip along Jl Batu Belig as fleeting blurs, on their way to a gallery opening, live music at Deus or sunset drinks at Old Man’s, and I swear that, next incarnation around, I will know their pleasures and pain. I’ve been staking out Batu Belig for almost two weeks now, trying out restaurants and cafes and enjoying the beachfront bars; I may one day penetrate the deep north but, for the moment, this area largely cruises at my speed. Of course, I have my favourites as well as my weaknesses, the places I really really want to love and figure if I support them enough (and try enough menu items) they will fulfill my expectations. 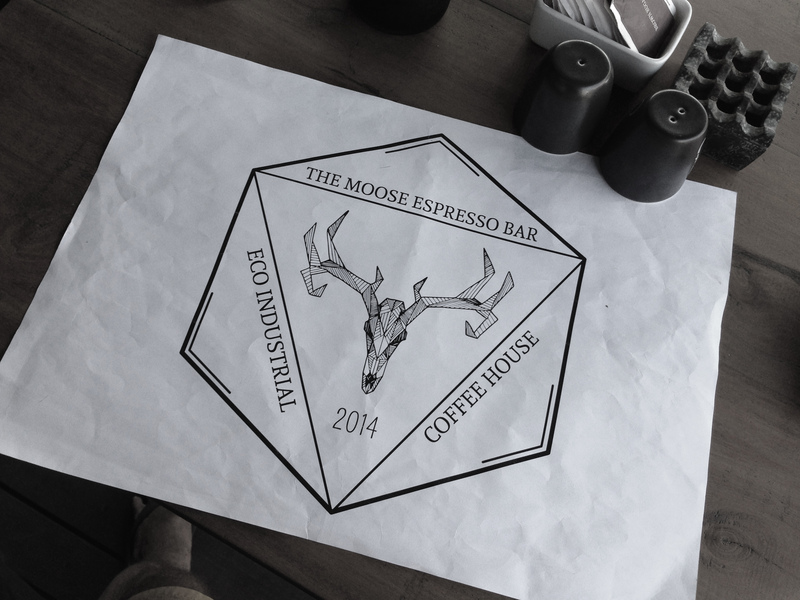 So to The Moose Espresso Bar. At the eastern extremity of Jl Batu Belig, I’ve been expecting the EuroModernes to frequent The Moose but maybe they already have and moved on or it’s too far out of their happy hunting grounds or maybe (though extremely unlikely) that they’re yet to discover it; the EuroModernes can discern a new café by fluctuations in the harmonic balance of the Universe. The Moose should certainly be on their radar. 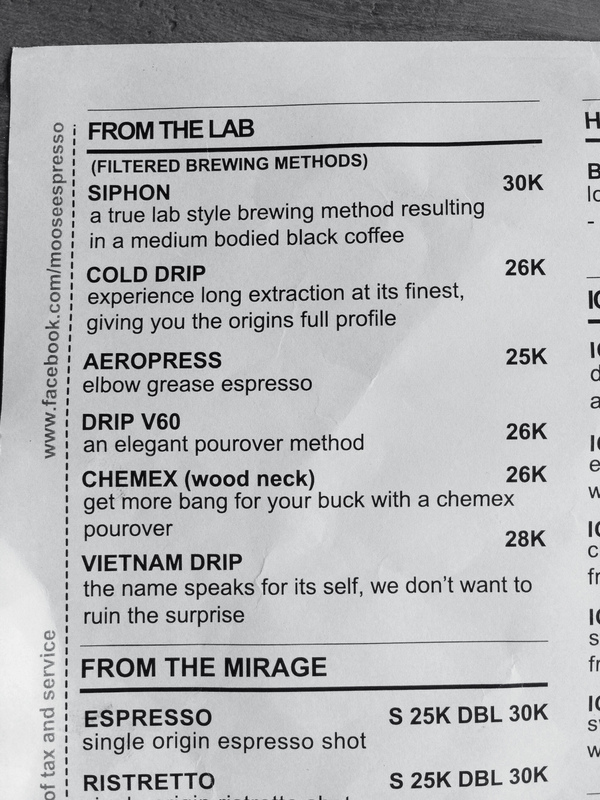 Billed as an “Eco-Industrial Coffee House”, it has a sustainability-skewed manifesto and a specialist coffee menu you have to see to believe. If that was all The Moose encompassed, you could easily write it off as faddish. 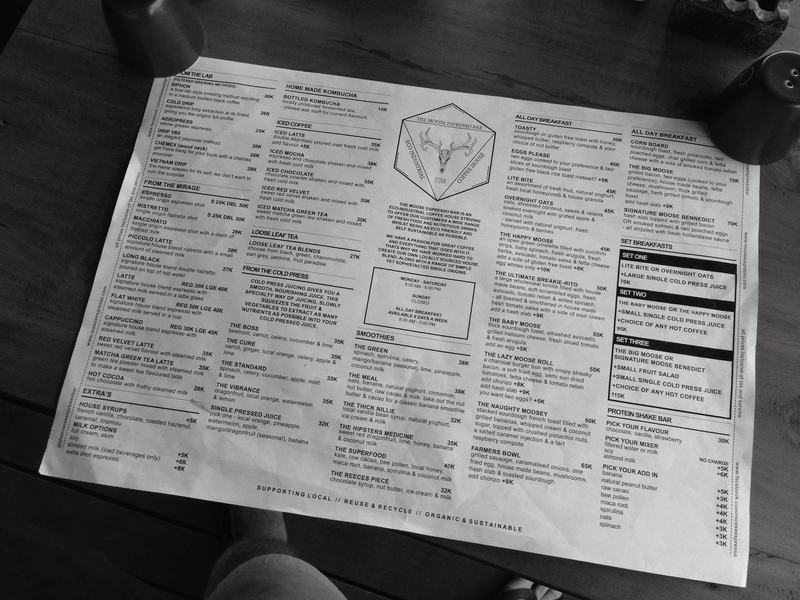 It was the breakfast menu that intrigued me most. Breakfast is one of my three favourite meals of the day. If there’s a couple of things on a breakfast menu that appeals to me, I consider myself lucky. Three and I’m infatuated. Four or more and I’ll marry the barista. On my inaugural visit, I decided on The Naughty Moosey (of which more later) but they were short of some key ingredients so it was back to the menu. I figured they’d also be out of Waldofs, so I ordered the Overnight Oats, described on the menu as “oats, shredded coconut, seeds and raisins, soaked overnight with grated apple and coconut milk, served with natural yoghurt, fresh honeycomb and berries”. The copywriters had pretty much summed up the spirit if not the intent of bircher muesli and it modestly emerged from the kitchen on a large black dinner plate. But the first spoonful was enough to prove the presentation a cruel tease and the intense contrast of creamily sweet oats and tart berries, with the mid-notes of fresh yoghurt, was an unexpected winner. And the coffee? 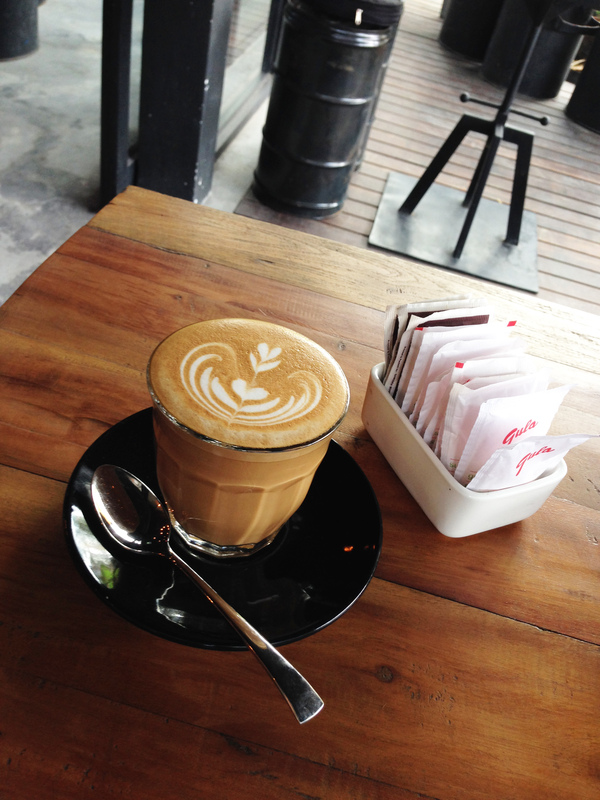 The strong latte was creamy and smooth and certainly lived up to its promise. The double macchiato on the first visit was a little bitter; later examples were considerably better. I could see what The Moose was setting out to do but was it all promise and no delivery? On a follow-up visit, I was finally able to order The Naughty Moosie. 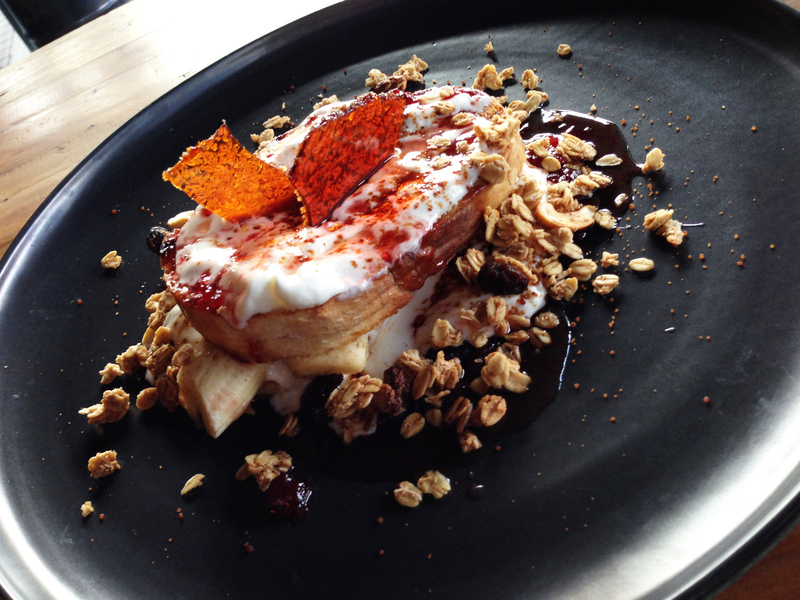 Again, I’ll quote the menu: “stacked sourdough French toast filled with grilled bananas, whipped cream and coconut sugar, topped with crushed pistachio nuts, a salted caramel injection and a tart raspberry compote”. And again, it emerged from the kitchen, framed by the now-familiar black dinner plate, unpresuming in appearance. This time, though, I knew what to expect. I looked at the Naughty Moosey through EuroModerne eyes and it dawned on me that this low-rise arrangement had a sapid simplicity that echoed Le Corbusier and my estimation of both them and The Moose rose even further. The taste? Sensational, not so much for what it should have been but for the audacity of what it was. No conventional French toast here; the two slices of sourdough were toasted rather than dipped in an egg mixture and pan fried, the bananas layered between. Below and above was the cream and coconut sugar, with the consistency and addictive richness of Cinnabon icing. Bold and subversive with a touch of danger; feed this to a toddler and he’ll be bouncing off the walls well into puberty. A breakfast that challenges what it means to have breakfast. I’m getting the hang of The Moose. And rather protective. I worry whether enough people will really “get” it. 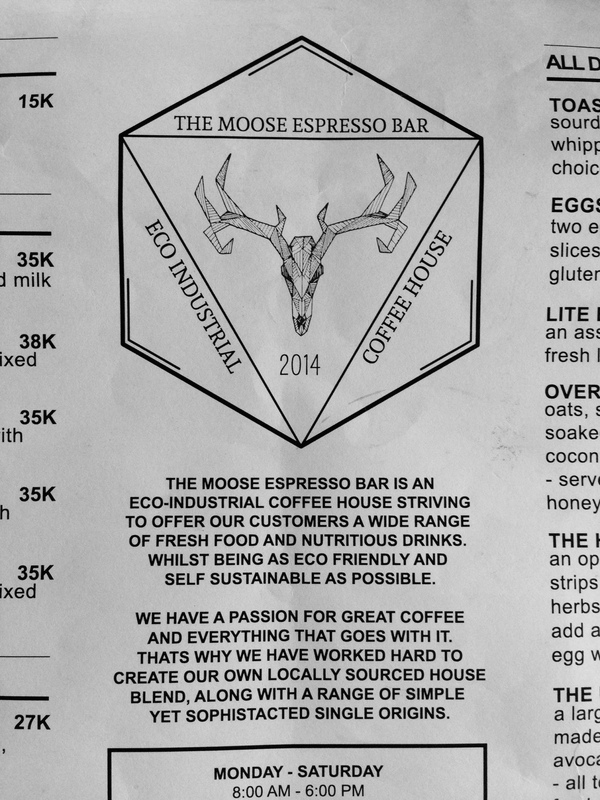 The Moose manifesto merely hints at its own ambitions to be more than an ordinary café. Next up, I’ll try the Big Moose or the Lazy Moose Roll. Maybe the Moose Benedict. Or the Corn Board if I’m feeling particularly healthy. There’s multiple options left to explore. And I’m most curious about by Hash Slab. And I’ll watch the café racers speed by with their precious (and precocious) cargos, and resist the urge to block Batu Belig and herd them inside. Maybe I’ll just keep The Moose for myself.